With the multiple negative influences that today’s culture exposes my children to on a daily basis, I am always on the lookout for toys that encourage good things in their lives. Thanks to Karma Media, we were recently given the opportunity to review a great new line of character inspired dolls- My Friend Huggles. My Friend Huggles were created by a mom who was on the search for toys that helped to create a “centered moral compass” in her children. Her understanding of how children learn best through play led her to incorporate little girls love for their stuffed friends with a strong positive message to create a toys that goes beyond simple fun. My Friend Huggles are life size dolls that have a wonderfully sweet, beautiful big eyes, adorable outfits and shoes and legs that cross when they stand and sit to remind young girls of the importance of good etiquette. 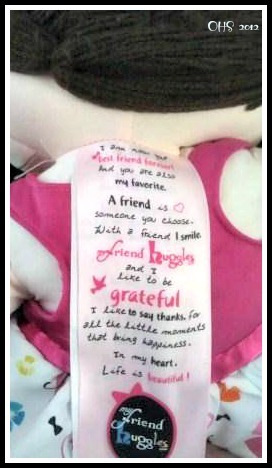 Beautiful Forever Mark– allows little girls to claim their Huggles as their BFF for life. Removable clothing and long, style friendly hair to encourage play and help with coordination and dressing. that allows additional enrichment play on the interactive My Friend Huggles website. These traits are beautifully displayed on the satin ribbon tag on the back of their necks. This reminds the little ones while they are playing that choosing good traits is the way to go. 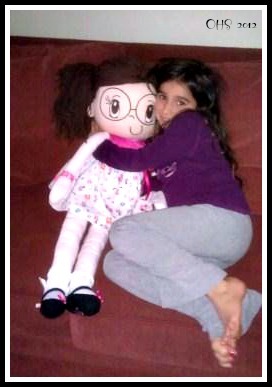 My little Abryanna was thrilled to receive her My Friend Huggles doll- Rubi. She came at the perfect time for us as my little one was struggling with some bullying at school and Rubi’s glasses gave us a great opportunity to talk about differences in people and how everyone is special regardless of what they look like or how they dress. Abryanna has introduced Rubi to all her little friends in the neighborhood and she has even been out to several restaurants with us. Everywhere we go we get questions about where we found her and that has given Abryanna the opportunity to share her with many people. My Friend Huggles are not just loved by children- they are also recipients of several awards including the Creative Child Magazine 2012 Creative Toy Award Seal of Excellence and Toy of the Year!! Be sure to check out these other great reviews of My Friend Huggles!! Disclaimer: I received no compensation for this post. 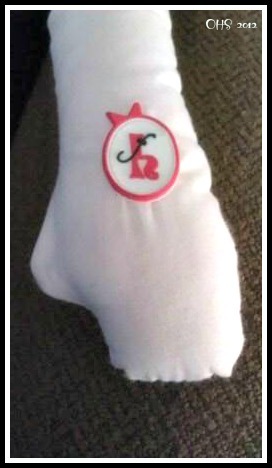 I did receive one My Friend Huggles dolls at no charge to assist in my writing this review. The opinions in this post are mine alone and are not influenced by any outside source. Would my friend juggles be an appropriate gift for an 8 year old? How old is your child? My granddaughter turns 8 in October. 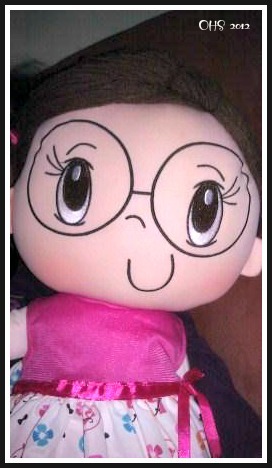 I would like to get her this doll. Is she too old for this doll?